Reasons for concern: Highly competitive invasive plant. Produces substances that are poisonous and sometimes fatal to sheep and cattle. Younger plants are most toxic. Easily invades disturbed or over-grazed areas. Plant tissues accumulate salts, which then leach into topsoil increasing soil salinity, making it inhospitable or toxic to other species. Saline soil favors Halogeton seed germination and seedling growth over native species. No forage value for wildlife or livestock. Classification: Non-native. A prohibited and restricted noxious weed on the Arizona Noxious Weed List. Botanical description: Erect annual with small fleshy leaves and multiple stems. Leaves: Numerous, alternate along stem, smooth, short and soft, with a small spine at tip. Small, fleshy, nearly tubular. Tipped with a needle-like spine. Dull green to bluish green. Stem(s): Has multiple reddish or purple tinged stems, branching from the base, with a stiff bristle tip. Seedling stems spreading; more mature stems upright. Grows from a few inches to 18 inches. Somewhat fleshy. Flowers: June through September. Fleshy and cylindrical. Clusters numerous and dense in most axes of stem and leaves. Flowers lack petals and have a fan-shaped structure concealing black or brown seeds. Seeds: August through October. Produces vast amounts of two types of seeds. Seeds produced in early summer are light tan and wingless; seeds produced in late summer are dark brown and winged. Do not last long in soil. Roots: Taproot grows to 18 inches or more. Lateral roots grow to 18 inches in all directions. Where it grows: Invades disturbed, open, or heavily grazed areas. Likes alkaline to saline soils. Grows along roads, sheep trails and often concentrated where livestock congregate. Likes dry lakebeds, shrublands, and roadsides, where native vegetation is sparse. Weedy characteristics: Seems well adapted to alkaline soils and semi-arid livestock ranges. Produces enormous quantities of seed. Dispersal by wind, water, humans, seed-gathering ants, animals. When plants dry out, they break off at the base and tumble in the wind. More than 100,000 seeds can be produced on one plant. Look-alike non-native plants: Before flowering, halogeton can be misidentified as Russian thistle (Salsola tragus) or barbwire Russian thistle (Salsola paulsenii), two other invasive, non-native plants. 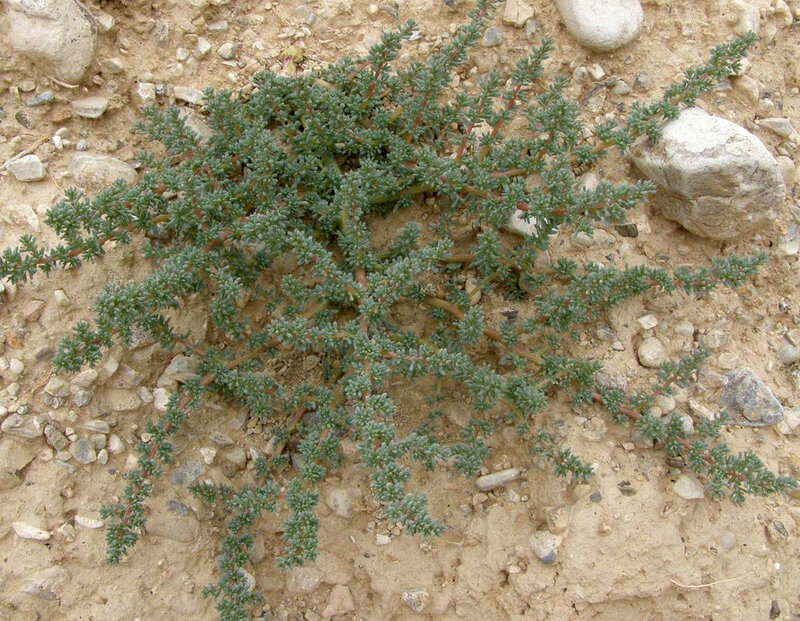 Information on Salsola tragus can be found on this website. Control strategies: Because this invasive plant is an annual, it is fairly easy to hand pull. Monitor populations regularly and pull any new plants. Do not let them bloom and go to seed. Establish desirable and vigorous perennial species to out-complete this invasive. Halogeton is not controlled effectively by burning, and it is one of the first plants to re-establish following wildfire on infested rangeland. For large populations, you may want to hire a professional. Broadleaf herbicides are effective on very young plants. Contact your local county extension office for more information on chemical control. Halogeton Poisoning University of Nevada Cooperative Extension.